Seattle is down by three points. The Super Bowl is on the line. Russell Wilson has led the offense expertly down the field after a thrilling kickoff return by Percy Harvin. The play call is relayed in by Darrell Bevell as the clock ticks down. The Seahawks want to force the defense to defend the run and the pass, so two tight ends trot onto the field. The game clock ticks down. Wilson snaps the ball. Broncos linebacker Von Miller reads the run coming his way, and attacks the line. Oddly, he finds himself moving backwards despite his legs churning forwards. Seahawks tight end Sean McGrath is walking him back off the line. It starts slowly, but McGrath gains momentum and has completely overpowered Miller by this point. Miller is a full five yards beyond the line of scrimmage when McGrath assassinates his dignity. He is no longer moving backwards because McGrath has planted him on his back. The last thing Miller sees is Marshawn Lynch darting past him into the end zone to win Seattle’s first Super Bowl. Meet Sean McGrath. He likes pancake blocks, sculpting, and very well may play a key role bringing a Lombardi trophy to the Northwest. 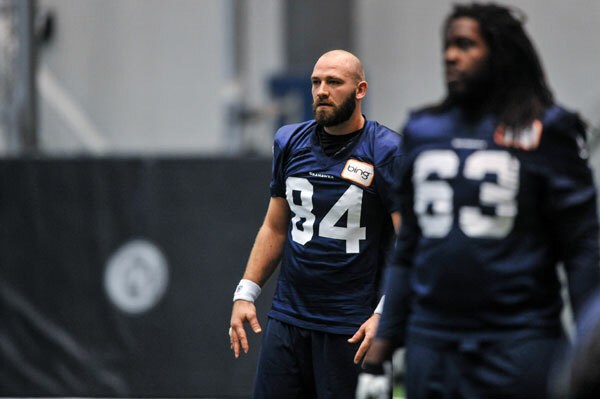 No offense to Seahawks rookie draft choice Luke Willson, who has received a lot of attention for his physical tools and success at rookie camp, but his name is not listed right after Zach Miller on the tight end depth chart. That honor belongs to the undrafted, unheralded second-year player out of Division II powerhouse Henderson State University. And McGrath is not satisfied with that. This is not a player looking over his shoulder. He is focused on finding the obstacle in front of him and clearing a path. In a league where tight ends are increasingly measured by the fleetness of their feet, McGrath takes pride in being a player that is just as likely to knock a defender silly as he is to run by them and use his Velcro hands. “My bread and butter in high school were pancake blocks,” said McGrath, who played in a triple option offense for the Corsairs of Carmel Catholic High School in Mundelein, Illinois. He always relished the physical part of the game, dating back to his days roaming the middle at MIKE linebacker in junior high. A growth spurt and a broken foot sustained in a skateboard accident robbed him of some of his speed as he entered the 8th grade, so coaches converted him to tight end. He only saw the ball thrown his way one or two times per game in high school, which helped him hone his blocking. It was not enough to make him a highly sought-after recruit, but he did land a scholarship to Eastern Illinois. The transition from a catholic high school to college was predictably fun. Unfortunately for McGrath, he had a little too much fun and was kicked off the team for violating team rules. It was a low point in his career. A kid whose first word was, “ball,” was facing the prospect of not being allowed to play with one any longer. Surprisingly, the coach that kicked him off the team, Jeff Hoover, was instrumental in keeping McGrath’s career afloat. Hoover put in a good word for McGrath to help him get into Henderson State University in Arkadelphia, Arkansas. McGrath secluded himself in a dry county (no alcohol allowed) in the bible belt and focused all of his attention on football. He set goals for himself. He wanted to catch a certain amount of passes. He wanted to maintain his playing weight, which was tough in the southern Sun. And, of course, he wanted a certain number of pancake blocks. McGrath went on to catch 55 passes for 565 yards and four touchdowns in 2010. He took on a leadership role in the locker room, and helped challenge players to raise their expectations. The team went undefeated last year, losing in the Division II championship. “I would like to think I was a contributing factor in what went on there,” McGrath said. Standing out at Henderson State was not enough to earn a spot in the NFL draft. He signed as a undrafted free agent with the Seahawks, knowing the team had three established tight ends, Miller, Anthony McCoy and Kellen Winslow Jr., ahead of him on the roster. In a training camp dominated by a three-headed quarterback battle, McGrath quietly earned a spot on the practice squad with steady play. His ability to find soft spots in coverage and his reliable hands made him a favorite target for Wilson and Matt Flynn as they rotated into the 2nd and 3rd string quarterback spots day-by-day. He may have been the most targeted receiver in camp when all was said and done. The Seahawks removed and re-added him to the practice squad a few times in 2012 before eventually adding him to the 53-man roster late in the season to replace Evan Moore. The timing could not have been better as his parents were already scheduled to come to town to watch the Seahawks take on the 49ers. McGrath’s ability to block made him an immediate contributor on special teams, while also serving as the third tight end. It was just a taste of what the NFL had to offer, but it was more than enough to inspire an off-season of training in preparation for 2013. Muscle has been added. Hours and hours of film has been studied. Goals have been set, including beating his quarterback to the VMAC, which he has only managed to do once so far. He sits in the film room with the quarterbacks, hoping to build a shared understanding of how to dissect defenses. Some of that work paid off in an OTA held yesterday. He sees greatness ahead for the Seahawks. He talks about how smart Max Unger is, and their shared experience as the rare NFL player that majored in art. He talks about wanting to help rookie tight end Willson adjust to life in the NFL because he knows it will only help make himself a better player. And he wants to make sure people do not sleep on the special teams, a part of his game he takes great pride in. His history includes being a long snapper, which may provide the Seahawks some roster flexibility should they choose to exercise it. Backup tight end McCoy injured himself in the first OTA, and will be out for the year. He saw 466 snaps last year, while Moore and McGrath combined for 107 more. McCoy was targeted sixth-most on the team (27 times), while primarily serving as a blocker. Willson brings 4.5 speed to the table that could be a major asset when the team needs to challenge the deep middle of the field, but the Seahawks are a running team. Many of McCoy’s snaps will go to the player that proves he can block effectively and catch reliably. That sounds a lot like McGrath, who talks about pancakes more than IHOP. When pressed to choose one of those blocks to spring someone for the winning touchdown in the Super Bowl, or being on the receiving end of Wilson throw to win the ring, McGrath eventually admits he would prefer the catch. The clock is ticking. Unger snaps the ball as Wilson drops back. McGrath dives at Von Miller’s feet, who avoids the block. Miller thinks he has successfully avoided being cut, and pursues Wilson. It is only after a few steps that he realizes he has been duped. McGrath picks himself up off the ground, and the undrafted tight end out of Henderson State throws his big hands in front of him to snag the pass gently lofted by Wilson for the game-clinching score as time expires. It may be a block. It may be a catch. One way or another, Sean McGrath is going to make opponents pay.